Guess what? I totally understand! After spending some time thinking the problem over, I came to a few conclusions. The desire to read isn’t going away. I can’t get rid of or diminish the demands of real life. Besides, who would really want to do that? Real life is where the living happens. We wouldn’t want to get rid of it! If two things have to co-exist, you might as well make them get along! How can we make our desire to read happily coexist with the need to be responsible and productive? Several years ago, I sat at a homeschool conference listening to a lecture by Woody Robertson, one of the founders of Lumerit Education (also known as CollegePlus). He was talking about best practices for learning and retaining information. One of the study techniques he talked about was the Pomodoro Technique. I’ll let you in on a secret — I had to use Google to find out the official name of the technique. I mentally labeled the tool as a study rhythm. In essence, the Pomodoro Technique is designed to increase productivity and reduce mental fatigue by placing short breaks between work periods. You work for 100 minutes and take a break for 20, then start over again. Working on a timer can be a great tool in many situations. Writers compete in “word wars” to see who can write the most words in a set amount of time. Parents set timers to tell their children how long they have to practice the piano. Blocking out time to really focus can also improve the efficiency and effectiveness of your studying. Try it. Set the timer for an hour and commit to completing a specific task before it goes off. 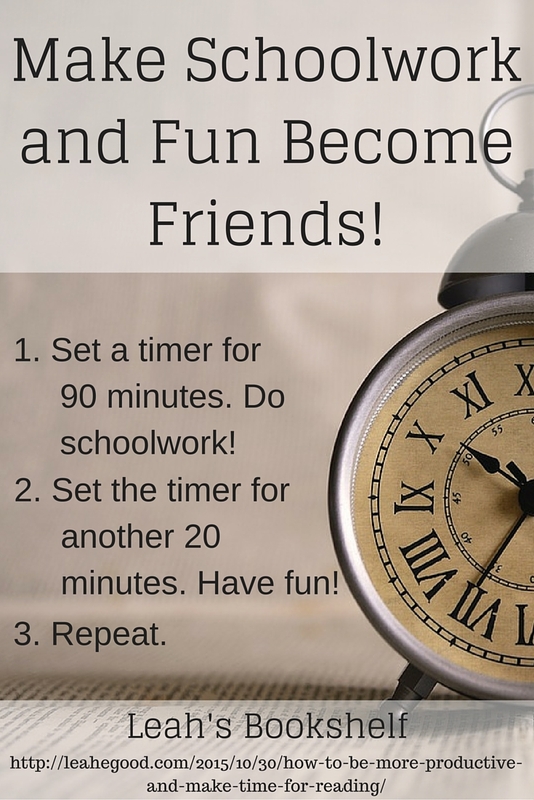 You can do a lot in an hour! Read a chapter of your history book. Complete your math problems. Draft an essay. Even attend a college class! When that timer goes off, set it again (for a shorter period of time) and enjoy taking that time to read (or do something else for fun) without feeling guilty. Taking breaks can improve your productivity. The trick is to stay disciplined and dive back into your next study session when the break period is over. Try spend 80% of your time working and 20% breaking … not the other way around! If you can train yourself to use this schedule, you’ll have time to read without feeling guilty and will get through your work faster too! 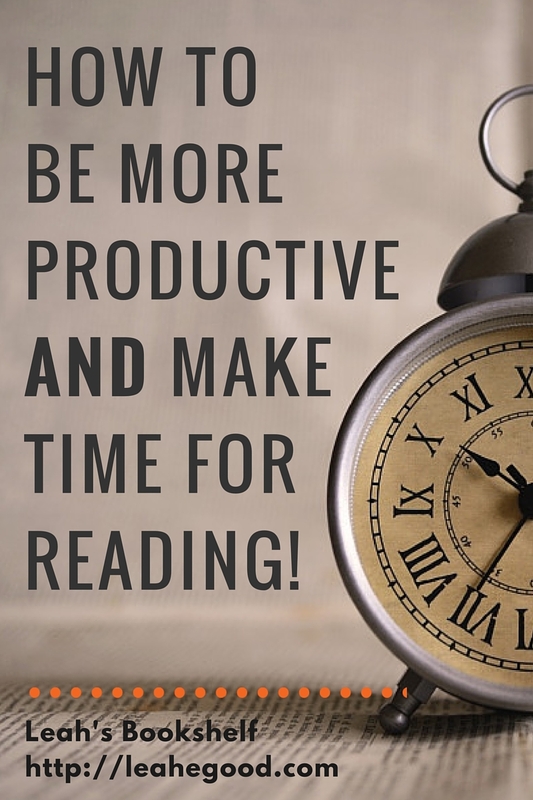 Using time management techniques is an awesome way to make more time for the books we love, but in case that’s not enough, there are even more benefits! Time management is a Biblical principle. That’s right! Learning how to make good use of your time is being obedient to God — and that’s way more important that reading the next novel on your list. Ephesians 5:16 tells us to redeem the time because the days are evil. Don’t forget to make time to read your Bible! Time management is a marketable skill. Earlier this week I had a job interview. As we talked about my unusual path through college, the interview said, “I imagine that you had to learn time management skills to do college that way.” I agreed and elaborated on the subject when she asked me to. Learning to make good use of your time will serve you well throughout your life. How can you apply time management techniques to more effectively plow through work and make time for reading? What time managements have you found helpful in the past? Do You Have a Love-Hate Relationship With Books? I just took the survey. . . am I too late? Which four books are on your wishlist??? “The Princess and the Goblin” by George MacDonald, which didn’t come directly from you since it was a guest post, but I still got it from your blog. The rest is the three books in “The Firmament Series”. I’ve read “In His Image” and “The Princess and the Goblin” before, but I want my own copy of them! Ooh. You and Spencer borrowed my e-copy of In His Image, right? Those are a good three books to have on your wish list. Have you read any of the Ilyon Chronicles yet? This is an interesting idea. I may try it for other things. However, I’ve tried something similar before for reading, and…it doesn’t work for me. Basically I’ve learned to leave my book aside until alllll the work is done, even if I have time in the morning before school or something, because that way my brain is out of the storyworld and can focus on the work. If I take breaks to read, my brain is constantly going in and out of the storyworld and that just makes it harder for me to focus. But it might work for someone else! Thanks for sharing!